Our goal was to not bring you “processed drums” that never get used as they wont ever fit into the mix, our aim was to bring you Honest Drum sounds that can be processed quickly by yourself inside the plugin, OR later in post. – we wanted to give you access to this new exciting product with a hands on easy approach as if your the one in control, similar to that of when your in a studio sitting behind the glass, where you get to make the choices. – Check out the video and see/hear it in action. – Please NOTE, Full Kontakt is needed, but can run in free player, but will need to restart your player every 15 mins.. – midi grooves are not part of this plugin. 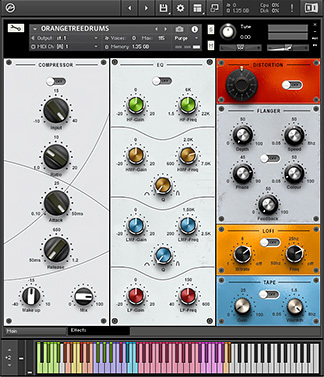 We combined lots of elements into a single package, to help assist you from a great drum sound from start to finish, – as a producer I always reach for a set of tools when it comes to drums, so we have placed these exactly where you want them, you can get creative or be gentle, you can be RAW to complete insane, using the kontakt engine really helped us to push the boundaries further. it makes things neat and tidy in a small area that doesn’t interrupt your workflow. – Our Effects section has major and minor utilities, – Compressor, this is useful to control dynamics of a beat, or to create a pumping vibe this can help make the drums sound bigger than they actually are, but too much and you will loose the delicate nature of a particular passage. EQ, this is based around a British style EQ, its delicate and precise with its useful 4 bands of EQ, this is really useful to tame any unwanted noises from perhaps the compressor or simply help fit it into the mix your working on. Distortion, this pretty much labels itself, dirt, grime and to the nasty & scary!. if your song requires it, then don’t be afraid to use it. – but warning!, this does not do subtle, and that’s why we love it!.. Flanger, a fun & enjoyment effect and hugely satisfying, really good for those pitched effects on drums (pitching all drums up by an octave for example) adding a flanger setting of your choice and mix to taste. – LoFi – another one for dirt and grime, a bit of a oddball as it has its good days and bad, when it works it works VERY well in a mix. but otherwise it can be a useful tool used very subtle, good for when you want to have a unique twist to something. – Tape, this is a tape emulation, so it can really warm the track up and also add a fruit load of harmonic distortion, if you want gentle harmonics use this instead of its angry brother in red above! “distortion” – the good thing about these is they are all laid out in front of you to twee, and we encourage that. as the more you don’t know the more you can learn!. – jump in and enjoy! The main section, “The console” this is where most of the mixing is done and also a major part of your sound design, we added various mic choices for you, from direct mics to ambience & rooms, aswell as globally trimming the volume of each kit piece, this in turn reduces the gain of the master groups (in gold and blue), we have one of the most used tools in drum production “Transient”, this can make the drums incredibly sustained (big) or very small and thin, but on the flip side it can make them very upfront or very relaxed and almost roomy using just 2 controls you can blend and twist to get your desired result, – we also have reverb sends per each mic part. – this is a useful feature for when you want to control just the reverb on a certain kit piece and not globally, then finally we have all the functions at the top of the page that can turn on/off the effects section (that can also be controlled via the “effects tab on the bottom of the plugin screen). – Overall, we hope you many happy times with this, its a joy to use and really does sound like a real drummer in our live room. – now you can have our studio inside your own!. Using the best mics we have here from Classic U47/67, Telefunken and FET style mics. Various degrees of velocity layers were created in this plugin with approx 12 hits per kit piece spread across 4 different hands (Left X2, Right X2) then works on a simple roundrobin way. Some noises were left on, as we thought it added a certain weight to it. – we believe the best way to record is sometimes keep the mic running! 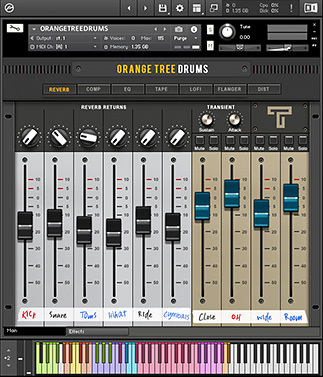 Does work with Vdrums (we tested with a TD11) so we cannot clarify any others, and cannot support this fact. There are no midi grooves, and we cannot add to this library of sounds, but we do plan on doing new drumkits very soon.